Chevrolet Tavera Neo 3 was launched today in the capital city of India with a price tag of Rs.7.51 lakh . This majestic vehicle was showcased in the recently completed 11th Automobile Expo in New Delhi. The latest car in the MUV segment has been smartened up a bit to give it a sporty and improved look. The front look of this vehicle is just amazing with a broader front grille, which also houses the company’s signature logo. The front head lamp cluster is also very bright and radiant and a pair of round fog lamps adorns the front bumper as seen in the Chevrolet Tavera Neo pictures. This MUV car also got a brand new engine, which is complaint with the latest BS – IV regulations. This means that this latest addition of Chevrolet Tavera Neo 3 can be sold in all the cities across the country. 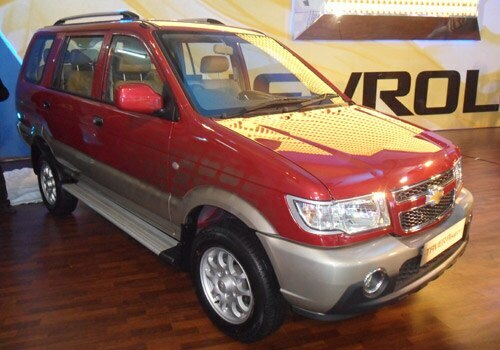 The engine of this grandiose Chevrolet Tavera Neo is a powerful 2.0L of 4 cylinder CRDI engine, which is easily capable of generating a peak torque of 264 Nm along with a maximum power of 107 Ps. This heavy engine is powered by the CRDI (Common Rail Turbo Diesel) technology, which is widely being used by most of the new cars makers for their diesel cars. The interiors of the car has also been tinkered a bit to give a revitalizing appeal to the Chevrolet Tavera Neo and at the same time to attract the customers in to buying this vehicle. The interiors have been refreshed with cashmere upholstery with self plaint design and leather uphostery for the captain seat variant along with ice blue illumination instrument panel that adds lustre to the whole car. Recently we shared a news that Maruti to roll out Maruti Ertiga MPV on 11th April.